No American player played better this winter than Tyler Adams, and no player will be watched more closely in the USA's friendly against Ecuador on Thursday in Orlando than Adams, who plays at holding midfielder for Red Bull Leipzig but has been moved to right back for the USA in a new hybrid role new U.S. coach Gregg Berhalter designed for him and introduced to the team in January. Adams has only been in camp with the USA for a couple of days, but he is moving into a role he has been learning for a while thanks to Skype. Like with Adams, Berhalter has used video conferencing with his players to go over the roles he sees for them on the national team and review how they have been doing with their clubs in addition to visits with his foreign-based players since February. Adams played at right back early in youth national team career, so he's used to playing different roles. In his two seasons with the New York Red Bulls, Adams displayed not just an enormous work rate but wisdom beyond his years. "If we have a conversation with him," Berhalter said, "he is very easy to talk to. He is easy to communicate with, he follows the conversation very easily. And you think he's open to the actual input you're trying to give him." The U.S. head coach has been impressed with how Adams, who moved to the Bundesliga from the Red Bulls in January, broke into the starting lineup at Red Bull Leipzig for the second game after the winter break and has been a big part of its success in holding on to third place in the Bundesliga. "He's done a tremendous job of breaking into the team at Red Bull," Berhalter said, "and keeping his starting position and actually helping what they are doing. He is an important piece to how they play. I think it has been a great step for him from MLS over to Leipzig and he's performed at a high level." Adams says his transition at Leipizg has been eased by the presence of Jesse Marsch, his former coach at the Red Bulls who joined Leipzig as an assistant last summer. “Jesse is a key for me since going there,” said Adams, “having someone that, when you were 16 years old, decided he wanted to sign you, and that was kind of like a father figure at a club for me." In his new role with the national team, Adams will be asked to move inside and help build the U.S. attack out of midfield -- something he says he does right now in Germany. “Sometimes you have the ball and you’re trying to attract players the right way and you’re facing your own goal when receiving the ball," he said, "so finding ways that you can be at the half-turn and play forward and still be dangerous. Because at the end of the day, we want to create chances, and I think in the role that I’m playing now, getting the ball and trying to penetrate is key in that position. Both Berhalter and Adams know there's a lot of hype about the young players on the national team, in particular Christian Pulisic, Weston McKennie and Adams, all 20 and all playing in the Bundesliga. Berhalter stressed that the decision to play Adams to right back and other tactical moves he is trying to introduce may not all work and the team will have to adapt. Right now, it's all about managing expectations. "We've been together for two days and this takes time," Berhalter said at Wednesday's pre-game press conference. "We hope tomorrow to see some of the things we're talking about. We also know it is not going to be perfect. We will lack fluidity at times. It's natural. We've been giving players a lot of information for the last couple of days. We're actually trying to pull back on some of it. All in all, we want material to evaluate." 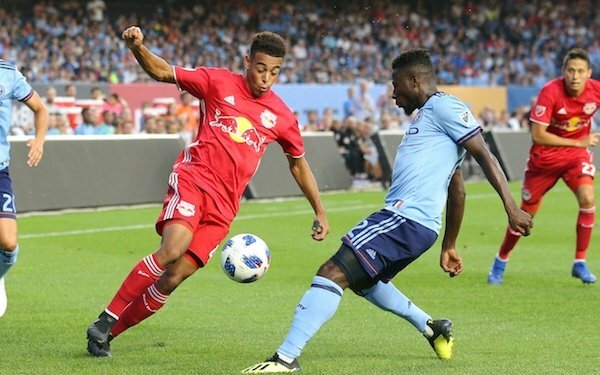 3 comments about "Gregg Berhalter gives young Tyler Adams big compliment: 'He is very easy to talk to'". beautiful game, March 20, 2019 at 10:02 p.m. If Adams is doing so well as a holding-mid ith RB Leipzig,why in the world would coach B experiment with him in a different position? Logic would dictate to paly each player in their comfort zone and leave the experiments when the situation dictates. Del_Cat_6 6 replied, March 20, 2019 at 10:58 p.m.
Nick Valenti, March 21, 2019 at 11:48 a.m.
Paul Arriola had a lot of success in the January camp. Is Berhalter trying to see if Adams can be even more of a handful as a wide player coming down the sideling to goal and a better D in transition than Arriola?